is achieved when Umgeni Water produces potable water and wastewater in full compliance with statutory and reliability requirements and consistent with customer and environmental needs. is achieved when Umgeni Water provides reliable, responsive, and affordable services in line with explicit, customer-agreed service levels and receives timely customer feedback to maintain responsiveness to customer needs and emergencies. is attained when Umgeni Water engenders understanding and support from statutory, contracted and non- contracted bodies for service levels, tariff structures, operating budgets, capital improvement programmes, risk management decisions and water resources adequacy. 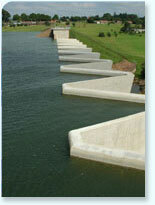 is achieved when Umgeni Water is explicitly cognisant of and attentive to the impacts it has on current andfuture community sustainability, supports socio-economic development, and manages its operations, infrastructure, and investments to protect, restore and enhance the natural environment, whilst using energy and other naturalresources efficiently. is achieved when Umgeni Water understands the organisational life - cycle costs and maintains a balance between debt and assets while managing operating expenditures and increasing revenues. In addition, the organisationaims at a sustainable tariff that is consistent with customer expectations, recovers costs and provides for future expansion. is achieved when Umgeni Water's leadership and staff work together to anticipate and avoid problems and proactively identify, assess, and establish tolerance levels for and proactively and effectively manages a full range of business risks, consistent with industry trends and system reliability goals. is achieved when Umgeni Water has ongoing, timely, cost-effective, reliable and sustainable performance improvements in all facets of its operations, minimises resource use, loss and impacts from day-to-day operations and maintains awareness of information and operational technology developments to anticipate and support timely adoption of improvements. achieved when Umgeni Water's understands the condition and costs associated with critical infrastructure assets and maintains and enhances the condition of all assets over the long-term. This is done at the lowest possible life - cycle cost and acceptable risk levels, is consistent with customer service and statutory-supported service levels and consistent with anticipated growth and system reliability goals. The organisation further assures that asset repair, rehabilitation and replacement efforts are coordinated to minimise disruptions and other negative consequences. is achieved when Umgeni Water assesses the scarcity of freshwater resources, investigates sustainable alternatives, manages water abstractions assiduously and has access to stable raw water resources to meet current and future customer needs. is achieved when Umgeni Water is a participatory, collaborative organisation dedicated to continual learning and improvement, recruits and retains a workforce that is competent, motivated, adaptive and works safely, ensures institutional knowledge is retained and improved, provides opportunities for professional and leadership development and creates an integrated and well-coordinated senior leadership team.